Few days ago my friend told me that after few months of unused period he powered his Kindle Paperwhite on and noticed that there is some problem. deregistering that device from Amazon account. Then i took the device for investigation and then in one news website (i don’t remember which website it was) i saw a news where it was said that “Amazon breaks all connections, login, cloud etc. 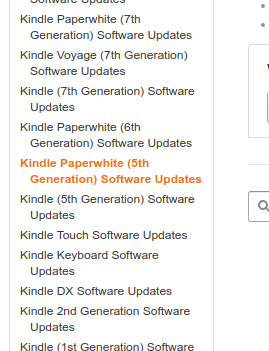 with Kindle devices with outdated software versions) – So it seems some ridiciolus state – you are in infinite loop. You can’t get it working because your software is outdated, and you can’t update your software because it is not working. The only way was updating via USB cable. I simply did it and it solved the issue. Choose your device from left sidebar. Unplug your device and from top-right menu you will see UPDATE KINDLE option. Choose it and wait for 2-3 minutes. After update is done you will be able to use your device with normal Amazon account connected.